Map posters and datasets (suitable for use in GIS) are available for all the measures introduced in this module. The datasets are national for each measure, climate scenario, and biological group (where applicable). The associated maps are organised by NRM cluster and by size (A0 and A3). The maps of specific vegetation types associated with the measure ‘projected distribution of vegetation types’ will be available shortly. Further details of the maps and datasets are provided in Technical Note 1 in the Helping Biodiversity Adapt Guide. 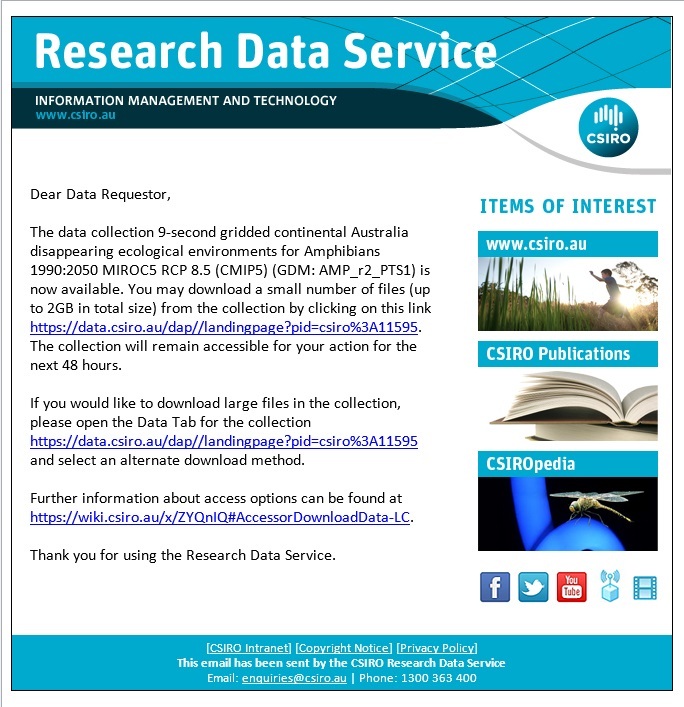 There are several ways to access these resources from the CSIRO Data Access Portal (DAP). Click on the instructions below for details. Visit the landing page for the map posters. From here, you can select the ‘Data’ tab and follow the instructions to download the map posters or scroll down to ‘Related Materials’ where links to each of the datasets should appear. 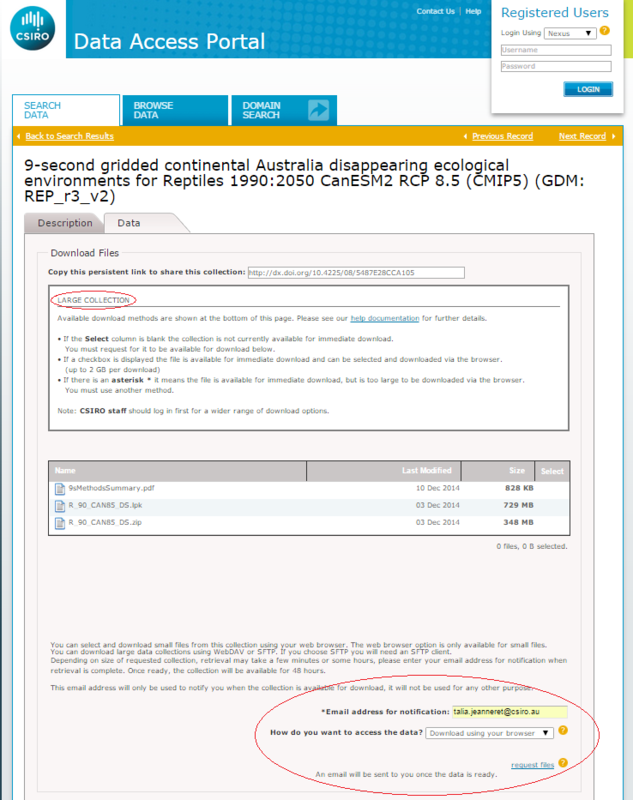 Visit the homepage for the CSIRO Data Access Portal (DAP) where you can use the search engine to find a specific resource. Below is a list of search terms we recommend you use. ‘adaptnrm biodiversity’ plus any of the measures and/or biological groups will limit your search to more specific datasets. For example, entering ‘adaptnrm biodiversity projected distribution vegetation’ will result in datasets for ‘projected distribution of vegetation types’ for each of the climate scenarios. Similarly, entering ‘adaptnrm biodiversity revegetation benefit’ will result in datasets for ‘revegetation benefit’ for each of the biological groups and climate scenarios. Please note that large collections in the DAP, such as the ‘projected distribution of vegetation types’ datasets are not always immediately available. Notification and instructions for access will appear in DAP for these large collections, as shown in the example below. Follow these instructions and, if required, complete the data request form at the bottom of the page. Following your data request, you will receive an email notification once the data has been made available. This can take minutes to some hours depending on the size of the collection. Follow the link to the DAP provided in the email. The requested files will be available for download for a 48 hour period. After this period another request will be needed to access and download files again. An example of the email notification is shown below.